A secondary use of the iSi whipped cream dispenser is making flash infusions, as in this Kaiser Penguin article on five minute falernum. This technique as my original motivation for wanting one, but when I learned that it could be used for cocktail foams, it motivated me to buy one at once. 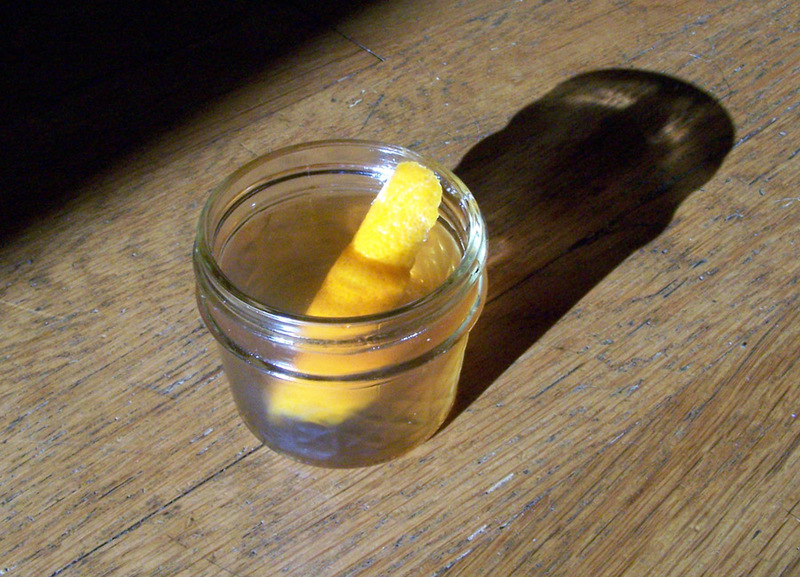 For my first foray into flash infusions, I decided to use peach and ginger to infuse bourbon. I thought this flavor combination would perfectly capture what I like about drinking iced tea on a summer afternoon. Place all in a whipped cream dispenser canister and seal. Discharges two nitrous oxide cartridges into the canister and allow to rest for ten minutes. Discharge all pressure before opening. Alas, on this afternoon I selected white peaches that were under-ripe, and their flavor was very light in the infusion. Fortunately, I used young ginger as an accompaniment, and the ginger flavor was light as well, yielding a balanced infusion. I would have preferred a stronger flavor, and I am certain that riper produce and mature ginger would have delivered. Even so, I soldiered on, adding lychee black tea and turbinado sugar syrup. Lychee-flavored tea was not my intention, but I was mixing on location, and it was available. The combination worked surprisingly well; the subtle lychee flavor rounded out the peach and ginger with an indistinct fruitiness that did not detract from the peach and bourbon flavor. On the whole, tea is a watery ingredient, and it made the drink very light, though in a pleasant way. Stir over ice and strain into a rocks glass. Garnish with a fat orange peel. Sugar really brings out the fruit flavors. And yet a part of me can’t help but wonder if all the pressure really did, in this case, was squeeze juice out of the fruit? Indeed the viscosity of the bourbon did thicken and resemble the nectar of a peach. My impression is that this technique would work better for herbs and spices than whole fruits. Categories: infusions, modern drinks, original creations | Tags: alcohol, bartending, black tea, booze, bourbon, drinking, drinks, ginger, iced tea, infuse, infusion, lychee, mixed drinks, mixology, peach, tea, whiskey | Permalink.